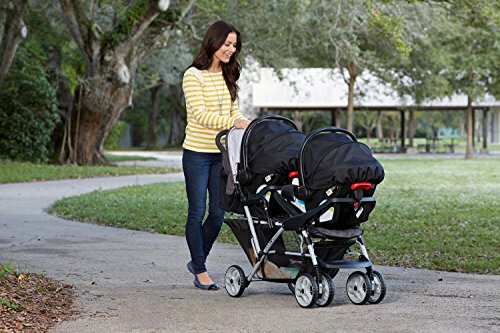 A smiling mother looking down at her kids in the Graco Duo Click Connect double stroller in the park! You can take the Graco DuoGlider Click Connect stroller anywhere! 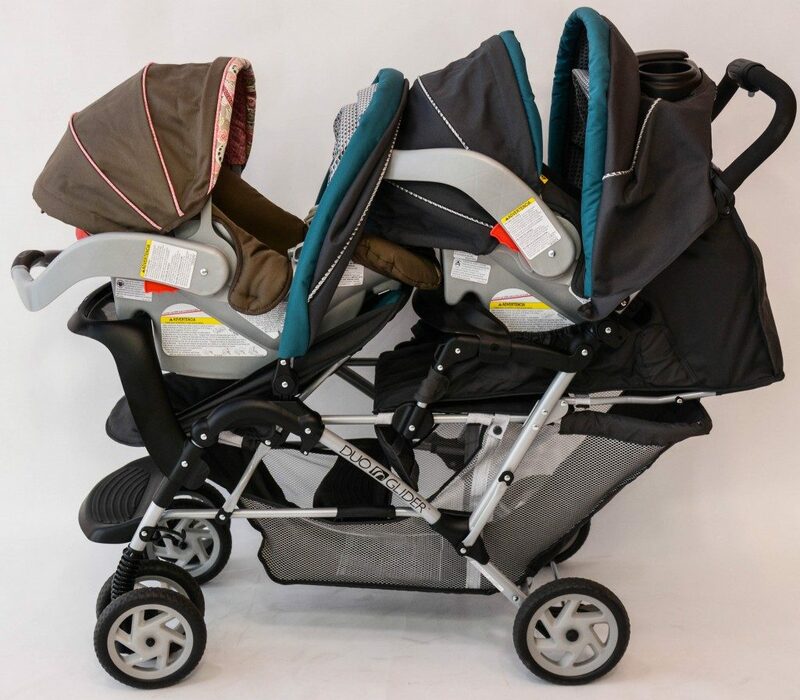 This double stroller is carseat compatible with its click connect system, and fits into any car easily. It has state-of-the-art brakes and an efficient suspension system that will make your children’s ride much more comfortable. 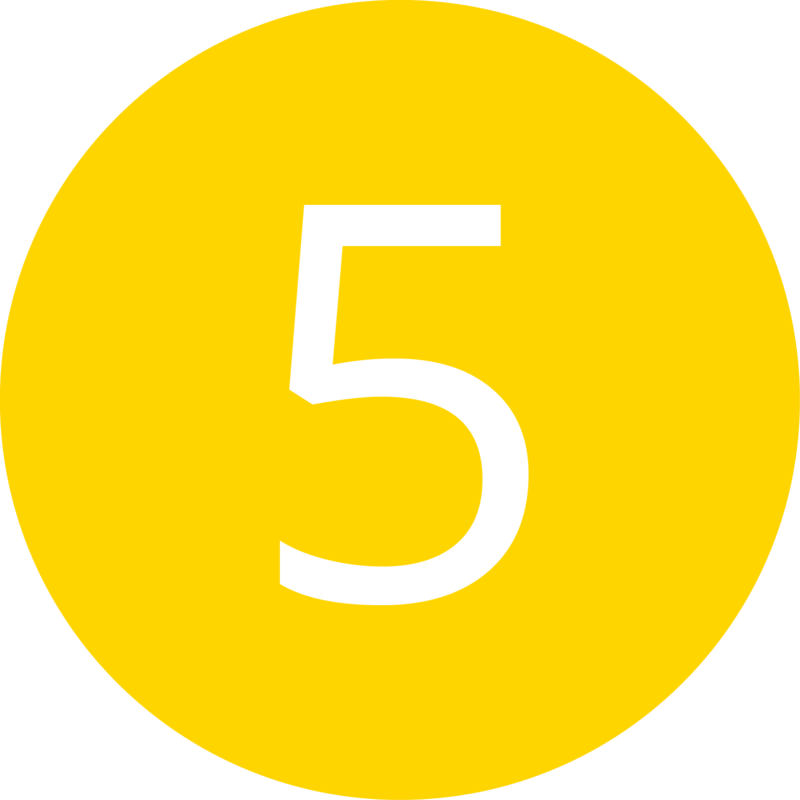 It is made up of very durable material and comes with a one-year warranty. It comes with removable trays and two cupholders. This stroller does not function at its best on rough terrain, but it makes up for it with how smooth a ride it offers on flatter surfaces. The Graco DuoGlider ranked as an 8 out of 10 in durability. Its wheels are made up of high-density rubber instead of traction, which makes them very durable and gives it better traction. The seats are also made of very durable fabric that will sustain many spills. The Graco DuoGlider Click Connect Stroller. At around 28 pounds, this stroller is relatively lightweight for a double stroller. The Graco DuoGlider is light enough to fold up and carry in one hand for busy, on-the-go parents. This lighter weight makes this stroller very easy to push, even with two passengers. 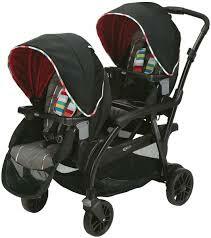 This double stroller has two parking brakes that are located on each rear wheel. These brakes are foot-operated, so this location is very convenient. To lock this stroller into place, you will need to step on both red levers at the same time. This stroller is compact enough to fit into any standard doorway. It folds down to an even more compact size so that parents can stow it away with ease when it’s not being used. This stroller does not fold down to as small a size as other double strollers, but it still ranks on the higher end of the spectrum. The DuoGlider received a perfect score in this area. This is because of how easy it is to assemble, fold, and maneuver in crowded areas. It is possible to fold and even steer using only one hand with ease. This stroller requires little to no effort when it comes to folding. All that’s needed to fold this stroller is the pull of a lever that is located on the handlebar. This motion collapses the stroller instantly and automatically locks it into place. The only downside of the folding aspect of this stroller is that it may not stand up when folded. The handlebars on this stroller are not adjustable but sit at a comfortable height for the vast majority of parents. This padded handlebar sits at a height and at an angle that ensure that parents have good posture while pushing the stroller and are comfortable with its weight. The DuoGlider is easy to maneuver due to its lighter weight and its lockable front swivel wheels. It is easy to guide this stroller through tight, narrow spaces and packed areas because of its compactness and versatility. Despite its being easy to maneuver, this stroller does not do as well on rough terrain. Its lockable swivel wheels have good traction, which makes it less susceptible to slipping on smooth surfaces, but they are not as accustomed to doing well on rougher surfaces such as gravel, rocky paths, or dirt trails. This stroller comes with cup holders, ample storage spaces, and a parent’s tray that comes with storage as well. Many reviewers agree that the cup holders are not big enough, but they are able to hold most bottles. Other accessories are available for purchase from Graco! It is not a huge task to assemble this stroller. Experienced parents may be able to assemble this stroller within 20 minutes or less. The manual that Graco provides is very thorough with easy-to-follow directions. This stroller is made up of water-resistant, stain-resistant fabric. To clean this stroller, a washcloth, soap, and water are the only necessary tools needed. The Graco DuoGlider comes with an extra large storage basket that parents have had no complaints about in terms of space! It has enough room to store all of your essentials such as diapers, toys, blankets, etc. The only downside is that when the seat in this stroller is reclined, it is very hard to access these items. The seats of the Graco DuoGlider are exceptionally comfortable because of their extra padding and multi-position recline. It also comes equipped with footrests and rotating canopies. This Graco DuoGlide has two medium-sized, adjustable canopies that are adjustable. These canopies are very efficient in blocking the sun and earned an 8 out of 10 in this category. The canopy in the front seat can also be removed if needed. The wheels of the DuoGlide have an effective suspension system that makes the ride for young passengers much smoother.